The symbolic principle of one thing being used or considered to represent another is the focus. Dictionaries have referred to “aphorism” as “predigested wisdom”, or “expressing an opinion or a general truth”. While “metaphor” stems off the idea of transferring or carrying, and concerns “figurative language” and “implicit comparison”. In the mountains the shortest route is from peak to peak but for that you must have long legs. Aphorisms should be peaks, and those to whom they are addressed should be big and tall of stature. When you understand the logic of an aphorism, it is obvious they could have a range of meaning, and so it was in astrological heritage. Aphorisms are frequently found with nearly the same combinations of factors, yet may be quite different in interpretation. Sometimes they may be literal but not always. In essence their contents were not intended to exhaust creative and contextual possibilities. Rather they are guiding demonstrations of astrology in action. 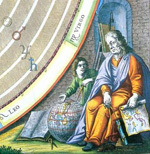 How theory applied to the individual aphorisms was an exercise largely left to the skill and judgement of the astrological student. The main point is this: the theoretical foundations of heritage astrology are quite elegant and can serve to bring about an intelligent use of traditional methods in modern times. This post is a brief summary of the presentation. The intensive was first presented in Brisbane (QFA) in July 2009 and on the Gold Coast (GCAS) in October 2009.